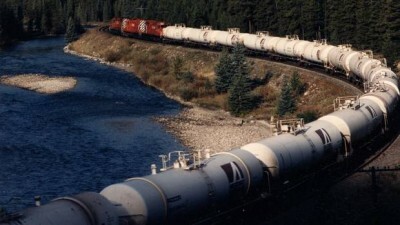 On July 3, the Association of American Railroads (AAR) released June 2014 data showing oil-by-rail and petroleum products at-large are moving at record levels throughout North America. The release of the data comes on the heels of the ongoing oil-by-rail nationwide week of action launched by environmental groups. For the 26th week of 2014 (the half year point) in the U.S., 18.5% more tank cars were on the tracks carrying petroleum and/or petroleum products than last year, a total of 15,894 cars. Examined on a year-to-date basis, 7.0% more of those same tank cars were on the tracks in the U.S. this year than last, totaling 380,961 cars to date. Across the border in Canada, the same trend lines exist: for the 26th week of 2014, 6.9% more cars moved petroleum and/or petroleum products by rail than in the 26th week of 2013. Looked at in terms of year-to-date compared to 2013, that totals a 7.7% increase in tank cars moving the commodity by rail. “Bomb trains,” as some critics call them, move oil obtained from hydraulic fracturing (“fracking”) in North Dakota’s Bakken Shale basin to terminals, holding facilities and markets both in the U.S. and Canada. Hence the upsurge in unit cars carrying petroleum and/or petroleum products both north and south of the border. Looked at through the lens of North America, 14.6% more tank cars carried petroleum and/or petroleum products during the 26th week of 2014 compared to the same time in 2013. And 7.0% more of those tank cars have moved petroleum and/or petroleum products to market so far this year as compared to last year. Beyond crunching numbers and statistics, AAR also is a lobbying tour de force for Big Rail in the same way the American Petroleum Institute (API) is for Big Oil. With its public relations work overseen and advised by SKDKnickerbocker — co-owned by former Obama White House communications director Anita Dunn —AAR has landed numerous meetings with the White House Office of Information and Regulatory Affairs (OIRA) in the attempt to water down crude-by-rail regulations currently being drafted by the U.S. Department of Transportation (DOT). As revealed on DeSmogBlog, AAR members gave a presentation to OIRA on June 10 on how companies would be faced with “far reaching economic impacts” if speed limits were imposed on trains carrying oil by rail. According to a DeSmogBlog review of federal lobbying disclosure documents, AAR has spent roughly $1.82 million on lobbying at the federal level so far in 2014. Additionally, AAR has doled out over $150,000 in campaign contributions to congressional candidates for the 2014 electoral cycle and is also active at the state level. Put another way, AAR’s political activism clarifies its hopes to produce more numbers and figures of the sort just unveiled in its most recent report. But will events like the oil-by-rail week of action block such hopes and dreams?